The College Football Playoff announced that Atlanta has been selected to host the 2018 College Football Playoff National Championship, which is scheduled to be played on Monday, Jan. 8, 2018, at Mercedes-Benz Stadium. Leaders from around the Atlanta community teamed up on the proposal which was submitted this past May, and Atlanta was ultimately selected over Houston, Miami and Santa Clara. The Atlanta Bid Committee included representatives of the Atlanta Convention & Visitors Bureau, Atlanta Falcons, Chick-fil-A Peach Bowl, Georgia Tech and the Georgia World Congress Center Authority. As part of Atlanta’s pitch, the Atlanta Bid Committee focused on the unique qualifications that set Atlanta apart, such as the accessibility with the world’s busiest airport and public transportation options, downtown walkability to hotels and world-class attractions like Mercedes-Benz Stadium, College Football Hall of Fame and the National Center for Civil and Human Rights. All of these combine to uniquely position Atlanta as a first-class, fan-friendly host city. Officials from the College Football Playoff visited Atlanta as part of the bid process in mid-July and toured ancillary event venues, hotels, the Mercedes-Benz Stadium Preview Center and the construction site of Mercedes-Benz Stadium. 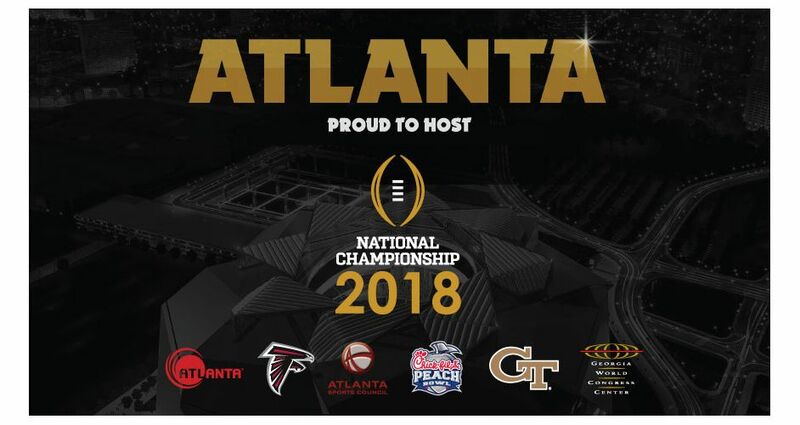 Atlanta is also home to the Chick-fil-A Peach Bowl who is part of the College Football Playoff’s six-bowl semifinal rotation, and is slated to host its first Playoff Semifinal on December 31, 2016, along with the Fiesta Bowl.